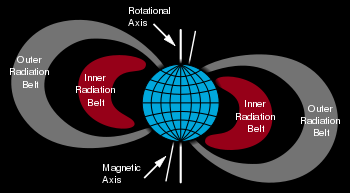 The Van Allen radiation belt (or Van Allen belt) is a torus of energetic charged particles (plasma) around Earth, held in place by Earth's magnetic field. Energetic electrons form two distinct radiation belts, and protons form a single belt. Earth's geomagnetic field is not uniformly distributed around its surface. On the Sun side, it is compressed because of the solar wind, and on the opposite side, it is elongated to around three Earth radii. This creates a cavity (called the Chapman Ferraro Cavity) in which the radiation belts reside. These belts are closely related to the polar aurora where particles strike the upper atmosphere and fluoresce. The term Van Allen belts refers specifically to the radiation belts surrounding Earth; however, similar radiation belts have been discovered around other planets. The possibility of trapped charged particles had previously been investigated by Kristian Birkeland, Carl Størmer, and Nicholas Christofilos prior to the Space Age. The existence of the belt was confirmed by the Explorer 1 and Explorer 3 missions in early 1958, under James Van Allen at the University of Iowa. The trapped radiation was first mapped out by Sputnik 3, Explorer 4, Pioneer 3, and Luna 1. As noted above, energetic electrons form two radiation belts, while protons form a single belt. Within these belts are particles capable of penetrating about 1 g/cm2 of shielding (such as 1 millimeter of lead). The Sun does not support long-term radiation belts. The Earth's atmosphere limits the belts' particles to regions above 200-1,000 km, while the belts do not extend past 7 Earth radii RE. The belts are confined to an area that extends about 65° from the celestial equator. An upcoming NASA mission, Radiation Belt Storm Probes will go further and gain scientific understanding (to the point of predictability) of how populations of relativistic electrons and ions in space form or change in response to changes in solar activity and the solar wind. Several NASA Institute for Advanced Concepts-funded studies are exploring whether it might be possible to use magnetic scoops to collect the antimatter that occurs naturally in the Van Allen belts of Earth, and ultimately, the belts of gas giants like Jupiter, hopefully at a lower cost per gram than laboratory production of antimatter. 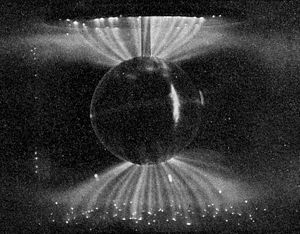 Laboratory simulation of the Van Allen belts' influence on the Solar Wind; these auroral-like Birkeland currents were created by the scientist Kristian Birkeland in his terrella, a magnetized anode globe in an evacuated chamber. The large outer radiation belt extends from an altitude of about three to ten Earth radii (RE) above the Earth's surface, and its greatest intensity is usually around 4-5 RE. The outer electron radiation belt is mostly produced by the inward radial diffusion [e.g. Elkinkington et al., 2001; Shprits and Thorne, 2004] and local acceleration [Horne et al., 2005; Shprits et al., 2006] due to transfer of energy from whistler mode plasma waves to radiation belt electrons. Radiation belt electrons are also constantly removed by collisions with atmospheric neutrals, losses to magnetopause, and the outward radial diffusion[Shprits et al., 2006]. The outer belt consists mainly of high energy (0.1–10 MeV) electrons trapped by the Earth's magnetosphere. The gyroradii for energetic protons would be large enough to bring them into contact with the Earth's atmosphere. The electrons here have a high flux and at the outer edge (close to the magnetopause), where geomagnetic field lines open into the geomagnetic "tail," fluxes of energetic electrons can drop to the low interplanetary levels within about 100 km (a decrease by a factor of 1,000). The trapped particle population of the outer belt is varied, containing electrons and various ions. Most of the ions are in the form of energetic protons, but a certain percentage are alpha particles and O+ oxygen ions, similar to those in the ionosphere but much more energetic. This mixture of ions suggests that ring current particles probably come from more than one source. The outer belt is larger than the inner belt, and its particle population fluctuates widely. Energetic (radiation) particle fluxes can increase and decrease dramatically as a consequence of geomagnetic storms, which are themselves triggered by magnetic field and plasma disturbances produced by the Sun. The increases are due to storm-related injections and acceleration of particles from the tail of the magnetosphere. There is debate as to whether the outer belt was discovered by the US Explorer 4 or the USSR Sputnik 2/3. 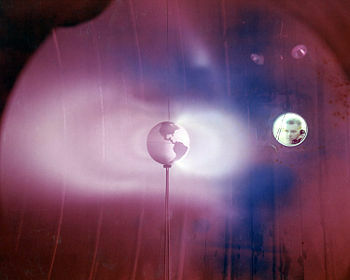 The inner Van Allen Belt extends from an altitude of 700–10,000 km (0.1 to 1.5 Earth radii) above the Earth's surface, and contains high concentrations of energetic protons with energies exceeding 100 MeV and electrons in the range of hundreds of kiloelectronvolts, trapped by the strong (relative to the outer belts) magnetic fields in the region. It is believed that protons of energies exceeding 50 MeV in the lower belts at lower altitudes are the result of the beta decay of neutrons created by cosmic ray collisions with nuclei of the upper atmosphere. The source of lower energy protons is believed to be proton diffusion due to changes in the magnetic field during geomagnetic storms. Due to the slight offset of the belts from Earth's geometric center, the inner Van Allen belt makes its closest approach to the surface at the South Atlantic Anomaly. Solar cells, integrated circuits, and sensors can be damaged by radiation. In 1962, the Van Allen belts were temporarily amplified by a high-altitude nuclear explosion (the Starfish Prime test) and several satellites ceased operation. Geomagnetic storms occasionally damage electronic components on spacecraft. Miniaturization and digitization of electronics and logic circuits have made satellites more vulnerable to radiation, as incoming ions may be as large as the circuit's charge. Electronics on satellites must be hardened against radiation to operate reliably. The Hubble Space Telescope, among other satellites, often has its sensors turned off when passing through regions of intense radiation. Missions beyond low earth orbit leave the protection of the geomagnetic field, and transit the Van Allen belts. Thus they may need to be shielded against exposure to cosmic rays, Van Allen radiation, or solar flares. An object satellite shielded by 3 mm of aluminum in an elliptic orbit passing through the radiation belt will receive about 2,500 rem (25 Sv) per year. It is generally understood that the inner and outer Van Allen belts result from different processes. The inner belt, consisting mainly of energetic protons, is the product of the decay of albedo neutrons which are themselves the result of cosmic ray collisions in the upper atmosphere. The outer belt consists mainly of electrons. They are injected from the geomagnetic tail following geomagnetic storms, and are subsequently energized though wave-particle interactions. Particles are trapped in the Earth's magnetic field because it is basically a magnetic mirror. Particles gyrate around field lines and also move along field lines. As particles encounter regions of stronger magnetic field where field lines converge, their "longitudinal" velocity is slowed and can be reversed, reflecting the particle. This causes the particle to bounce back and forth between the earth's poles, where the magnetic field increases. A gap between the inner and outer Van Allen belts, sometimes called safe zone or safe slot, is caused by the very low frequency (VLF) waves which scatter particles in pitch angle which results in the loss of particles to the atmosphere. Solar outbursts can pump particles into the gap but they drain again in a matter of days. The radio waves were originally thought to be generated by turbulence in the radiation belts, but recent work by James Green of the NASA Goddard Space Flight Center comparing maps of lightning activity collected by the Micro Lab 1 spacecraft with data on radio waves in the radiation-belt gap from the IMAGE spacecraft suggests that they're actually generated by lightning within Earth's atmosphere. The radio waves they generate strike the ionosphere at the right angle to pass through it only at high latitudes, where the lower ends of the gap approach the upper atmosphere. These results are still under scientific debate. There have been nuclear tests in space that have caused artificial radiation belts. Starfish Prime, a high altitude nuclear test, created an artificial radiation belt that damaged or destroyed as many as one third of the satellites in low earth orbit at the time. Thomas Gold has argued that the outer belt is left over from the aurora while Alex Dessler has argued that the belt is a result of volcanic activity. In another view, the belts could be considered a flow of electric current that is fed by the solar wind. With the protons being positive and the electrons being negative, the area between the belts is sometimes subjected to a current flow, which "drains" away. The belts are also thought to drive auroras, lightning and many other electrical effects. The belts are a hazard for artificial satellites and moderately dangerous for human beings, difficult and expensive to shield against. For these reasons, the late Robert L. Forward proposed a method, called HiVolt, to drain at least the inner belt to 1 percent of its natural level within a year. The proposal involves deploying highly electrically charged tethers in orbit. The idea is that the electrons would be deflected by the large electrostatic fields and intersect the atmosphere and harmlessly dissipate. ↑ David P. Stern and Mauricio Peredo, Trapped Radiation—History. NASA. Retrieved December 19, 2008. ↑ James Bickford, Extraction of Antiparticles Concentrated in Planetary Magnetic Fields. NASA. Retrieved December 19, 2008. ↑ Andy Ptak, 1997. Ask an Astrophysicist. NASA GSFC. Retrieved December 19, 2008. ↑ David Leonard, 2002. Proposal: Removing Earth's Radiation Belts. Space.com. Retrieved December 19, 2008. Adams, L., R. Harboe Sorensen, A.G. Siedle Holmes, A.K. Ward, and R. Bull. 1991. Measurement of SEU and total dose in geostationary orbit under normal and solar flare conditions. IEEE Transactions on Nuclear Science. NS 38(6):1686-1692. Hess, Wilmot N. 1968. The Radiation Belt and Magnetosphere. Waltham, MA: Blaisdell Pub. Co.
Holmes-Siedle, A.G., and L. Adams. 2002. Handbook of Radiation Effects. Oxford, UK: Oxford University Press. ISBN 019850733X. Shprits, Y.Y., et al. 2008. Review of modeling of losses and sources of relativistic electrons in the outer radiation belt I: Radial transport. Journal of Atmospheric and Solar-Terrestrial Physics 70(14):1679-1693. Shprits, Y.Y., et al. 2008. Review of modeling of losses and sources of relativistic electrons in the outer radiation belt II: Local Processes. Journal of Atmospheric and Solar-Terrestrial Physics 70(14):1694-1713. Tascione, Thomas F. 1994. Introduction to the Space Environment, 2nd edition. Malabar, FL: Kreiger Publishing CO. ISBN 0894640445. Walt, Martin. 1994. Introduction to Geomagnetically Trapped Radiation. Cambridge, UK; New York, NY: Cambridge University Press. ISBN 9780521431439. Stern, D.P., and M. Peredo. 2004. The Exploration of the Earth's Magnetosphere. NASA. History of "Van Allen radiation belt"
This page was last modified on 14 January 2016, at 16:44.